YellowAirplane.com: World Globes, Earth Globe, Mercury, Venus, Moon (Lunar), Mars, Jupiter and Saturn Globes. World Globes, Earth Globes, & Other Globes of the Moon and Mars. 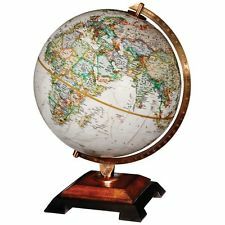 World Globes, World Globe Pictures, World Globe Maps, Earth Globe, Mars Globe, Moon Globe, Lunar Globes. We have all of these globes for your home, office or classroom. When you have a globe in the house your kids are a step ahead of the other kids. Your kids will spend hours looking at their globe and compare it to flat maps of the world. With all of the news about Mars exploration and Lunar Exploration, your kids will also like a Mars Globe or a Moon Globe too. These are great for gifts too. Give your relatives or your friends kids a globe too, it works because your kids and their kids will all learn by looking at their globes. Look at the Google Earth Online Globe, it's great. Also, look at the NASA Earth Globe and their Lunar Online Globe, it's great too. They are both free downloads. The NASA Globe is actually called NASA Wind which includes high resolutions of both the Earth and Moon's surface. Another great feature of NASA Wind is that you can change the monthly view and see the Earth as the ice pack grows and recedes. To sum up we have A great selection of globes of the earth, the Moon and Mars, plus online globe downloads.